Recommended for Insufficient cerebral circulation, associated complaints like tinnitus (buzzing) and vertigo. The ginkgo is the oldest living tree species, geological records indicate this plant has been growing on earth for 150 - 200 million years. 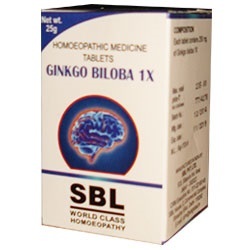 Ginkgo is gaining recognition as a brain tonic that enhances memory because of its positive effects on the vascular system, especially in the cerebellum. It is also used as a treatment for vertigo, tinnitus (ringing in the ears) and a variety of neurological disorders and circulation problems. Ginkgo may help to counteract the effects of aging, including mental fatigue and lack of energy.